As you are looking at your next vacation, you have two options: You can do it all yourself. Or you could sign up for one of many group travel tours with a travel company. While the DIY travel approach has some advantages, there are far more upsides to group travel than you might realize. 1. The planning details won’t be so overwhelming. Booking lodging, transportation, excursions and flights can be a lot of work, especially in foreign countries that you have never been to, where you don’t know the language and aren’t familiar with the currency. Even catching a cab can be a hassle. When you go in a tour group, those things are off your shoulders. All you have to do is pack and show up for your flight while someone else does the work for you. 2. Tried and tested tour stops. If you’ve never been to your destination, it can be tricky to figure out where you should visit or even where you should eat. As a company that does group travel tours, we have been to these destinations over and over. That means we know the spots are worth a visit and which to skip. 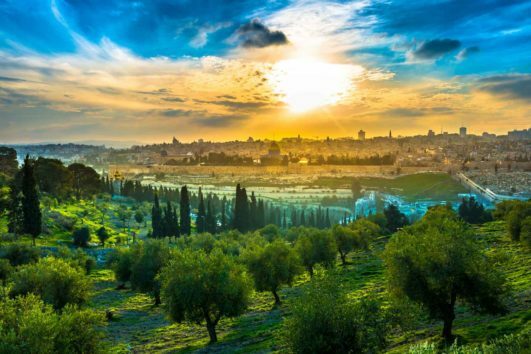 For the past two decades, we have been scouting out premier options, as we discussed in our blog about the 10 ultimate Biblical destinations. While we have found travel is safer than people perceive it, some inherent risk still exists. There is also a lot you can do to reduce the risk. One thing is to travel with a group, where there are others with you, watching out for you. You also have an experienced liaison and local guides with you who know the area, where to avoid and can alert you to anything potential safety issues. 4. You can relax more. Similar to travel preparation, once you are in the country, you don’t have to worry about the details. With a group travel tour, someone is always there to do that for you. Someone else will deal with negotiating tips with the driver. Someone else will figure out an alternative plan if a scheduled event is delayed or canceled. Someone else will pay the bill, while you lounge on your hotel patio. 5. You might find love. Are you single? For one, traveling alone isn’t for everyone. But there is always the chance you could find love on your trip. Hey, it’s happened before. While there is no guarantee, taking the risk and going on a tour opens you up to the possibility of meeting someone else with similar interests and values as you. As they say, it’s all in who you know. As a tour company, there are various vendors we have access to that the every-day traveler doesn’t. We work with airlines, hotels, restaurants, and other vendors to get the best deals for our travelers. We take advantage of group discounts and contracts to get you the best deal possible. While a solo trip might appear cheaper when you are planning, it’s easy to miss the nickel and dime expenses you will encounter along the way. Having done hundreds of trips, we know what to expect in terms of cost and factor it into your price or give you a heads up from the outset. 7. Experts travel with you on group travel tours. So many destinations come alive when you have someone who knows a lot about them and can explain the history and context. On our group travel tours, our experts — such as apologetics speaker Frank Turek or teacher and author Joel Richardson — travel with you, eat dinner with you, provide teaching sessions as you are standing at the sites, and answer your questions. While a self-guided tour through the City of David might sound nice, you might miss the fascinating explanation of all the tucked away biblical events, such as the Melchizedek standing stone or the Pool of Siloam. These are things you only get when you travel with the experts. 8. You’ll make friends for life. One thing we hear again and again from our travelers is about the relationships they built with the people they met on their tours. These are priceless and often last a lifetime. One of our clients had the teaching pastor on the tour officiate her wedding. Many others have become long-term friends with their tour roommates. When you travel with like-minded people, you connect in ways you might not have expected. Group travel tours may not be something you had considered in the past. Maybe you didn’t like the idea of not choosing your own itinerary or being with people you don’t know. But the advantages of this type of trip make group tours worth trying out as you are looking at your next vacation. You never know, you might not ever go back to the DIY approach. Interested in looking at the options? Check out our available Christian tours and Christian cruises, or have one customized for your church or group.